Try these easy and delicious Caramel Chocolate Nut Marshmallows!! 7 ounces of dulce de leche mixed with 7 ounces of sweetened condensed milk, add a dash of cinnamon and a bit of vanilla, and stirred it up on top of a double boiler. Put the marshmallows out on a waxed-paper-lined tray and stick toothpicks in them. One by one dip the marshmallows in the caramel mixture, still simmering on the double boiler, and then place them on the waxed paper. In a small shallow dish, I put chopped nuts. Then temper some chocolate. 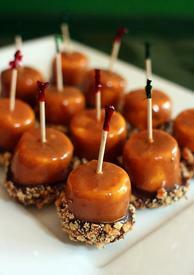 Dip the caramel marshmallows in the chocolate, but only covering the bottom third of the marshmallow. Then dip the wet chocolate into the nuts. The dipping can be kind of tricky. You have to shake off a lot of chocolate before dipping so that the chocolate doesn’t fall off into the garnish dish.